Does 19th November ring a bell? Did you remember to send a card to both Jodie Foster and Meg Ryan? Were you still mourning Schubert's death, or in the loo thinking about World Toilet Day? You may not have realised that 19-NOV-2009 (in VAX speak) was Social Enterprise Day, part of Enterprise Week, a constituent of Bridge Month in the Year of Kirk(2). Being decent folk, we decided to join other right-thinking people and partake in C4SED, aka Co-operating for Social Enterprise Day. If you want to learn about getting along, there's no better location than the Co-op Education Centre. What's that, you say? There's a cafe run by the Princes Trust? It may only be in operation one day a year but that level of presenteeism puts Brigadoon to shame. Their place on Fore Street is busy and bustling today with a whole register of schoolkids, and the makeshift caff within has as many assistants as customers, reminiscent of over-the-road Martin and Newby's in their heyday. Order your lunch from a single sheet large type laminated menu, a less-is-more attitude that the likes of Blends should consider. Bargain bacon butties and toasties on their way, our Co-op condimented is hassled by the inevitable raffle ticket seller. She's very nice, actually -- no sir, the star prize isn't a speedboat -- and it's all for a Good Cause. Odd blinged-up bloke at the next table: that'll be David Goldsmith, the current mayor of Ipswich. From teashop to coffeehouse, he won't leave us alone. We're bombarded by youths wanting to help, so it's only right to summon up tea and sweet stuff, in my case a lovely lemon cupcake, possibly direct from the Co-op's finest range. Tea seems to be accompanied by a random number of biscuits, though nobody's complaining. There's business advice upstairs, handmade crafts downstairs and that slightly ramshackle feeling you get at a church fete. We tally up, press money into helpers' hands and depart, having done our bit. Home, knuckle down to work, phone rings: Is that Mr Broom? 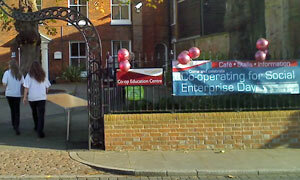 It's the Co-op Education Centre here -- you've won the hamper. If it was a car -- Citroen 2CV. If they were passing by -- Stephen Tompkinson.